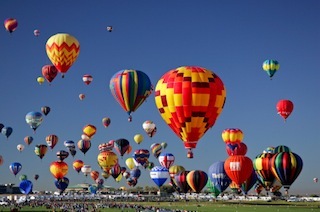 Living in Rio Rancho, NM makes it easy to participate in annual traditions like the Balloon Fiesta. Just 30 minutes north of Albuquerque, Rio Rancho is a charming city in New Mexico which offers a quiet retreat for visiting, or relocating, active adult retirees. Rio Rancho is the third-largest city in New Mexico, as well as one of the state's fastest growing cities. The area offers small-town charm as well as many varied attractions. It is also home to some lovely active adult communities. The Rio Rancho area lies just west of the Rio Grande in the Albuquerque Basin. The city is bordered by Albuquerque, Bernalillo, Corrales and the Santa Ana Indian Reservation. The city sits at approximately 5,290 feet above sea level and its high desert climate is perfect for many outdoor recreational activities. With its high desert climate, the region features an arid setting with hot summers and mild winters. During the height of summer, average daytime temperatures are in the mid-90s, but can easily climb to over 100 degrees. Typically winter days are in the low to mid-50s, yet record highs during the winter months are in the mid-70s. The Rio Rancho area offers scenic desert beauty and a rich history. Visitors can explore nearby Indian pueblos at Bandelier National Monument and Coronado State Monument, or take a drive along the beautiful Jemez Mountain Trail. The area is also home to the Valles Caldera National Preserve, an 89,000 acre old ranch property which now provides the perfect place to contemplate New Mexico's scenic beauty. Visitors may also want to experience the preserved heritage at Rio Ranch Valley's historic Village of Corrales. Rio Rancho is part of the Albuquerque metropolitan area, yet it features many of its own attractions, including shopping centers and restaurants. Locals and visitors alike can try their luck at local casinos, including Santa Ana Star Casino, Sandia Resort and Casino, and San Felipe's Casino Hollywood. Live entertainment is also available at Lounge 54 and The Stage at Santa Ana Star Casino. Other local attractions include Premiere Cinema 14, Tenpins & More at Rio Rancho, and J & R Vintage Auto Museum. In the surrounding area, Rio Rancho residents and visitors can also enjoy exploring the Corrales Wine Loop and Central New Mexico wineries. A number of wineries in the area offer tours and tastings, while wine lovers celebrate each Labor Day Weekend with the New Mexico Wine Festival at Bernalillo. Other annual festivals and special events in the area include the Pork & Brew BBQ State Championship, held in July, and the Taste of Rio Rancho festival, in February. Its close proximity to Albuquerque, also makes it easy for Rio Rancho residents to attend the city's world-famous Balloon Fiesta each October. Whether looking for a scenic retirement destination or a quiet vacation retreat, Rio Rancho is a New Mexico city which appeals to many active adults.